Harlem has a new queen. After the violent removal of her cousin Cornell Stokes from his perch at Harlem's Paradise in season one of Luke Cage, Mariah Dillard is settling into her new role as the reigning crime lord of the NYC neighborhood at the onset of the new season of the Marvel series, which dropped on Netflix on Friday, June 22. And while there are certainly some growing pains to be overcome as she and her lover/trusty No. 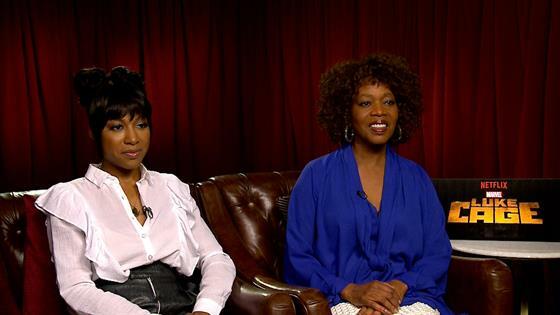 2 Shades (Theo Rossi) consolidate their power while keeping Luke (Mike Colter) and Misty Knight (Simone Messick) at bay, star Alfre Woodard (who has proven to be an absolute badass in the role) admitted that Mariah has been groomed for this moment all her life. "Heavy is the head that wears the crown. But she's born for it and she's trained for it," Woodard told E! News about Mariah's journey. "It's her legacy and she reluctantly stepped into it, but just like any hurricane, she's gained strength and she's at the top of her game in season two." As the season begins, fans will see Mariah work to go legit and leave the more nefarious underworld dealings her family's had their hands in over the years behind. While you might be able to guess how well that goes, Woodward admitted that straddling both worlds should come easy to Mariah. "She is a worldly person, and we all know that the world of finance is as illegitimate as it is legit, so she's used to living in dual worlds," Woodard said. "I mean, she does that as an African-American woman in a dominant culture. So, yeah, she's ready for that." Where Does Luke Cage Rank Among TV's Superhero Shows? The new season introduces a pair of new characters lifted from the comic books, both of whom have some surprising ties to Mariah that are revealed along the way during the season. (No spoilers here!) Gabrielle Dennis joins the show as Tilda Johnson, a local doctor who runs her own homeopathic remedy store. And as Dennis revealed, while Tilda tries to stay out the trouble that naturally comes with being associated with the world of Luke Cage in any way, it keeps finding its way to her. "It's kind of that world where you're new to town, you're new in this space, and you're trying to find your lane and find your way. And Tilda tries her hardest to kind of keep her head above water and keep away from the trouble, but the trouble keeps finding its way to the doorstep of Mother's Touch, the business that she owns," Dennis said. "But I think what's great and what people appreciate on this, her journey, is watching her grow as a woman. Watching her grow as this human being into finding an inner strength that has always been there. I feel like it's that Kendrick Lamar song, it's in her DNA. There's things about her that she's learning along the way that eventually leads her to a big decision that she has to make by the end of the season." The other big addition in season two is new villain Bushmaster (Mustafa Shakir), who arrives in Harlem with powers that rival Luke's (seriously, the beat down he gives our hero upon their first meeting is brutal) and an intention of claiming the neighborhood for his own. One would think that a powerful challenge to her rule would leave Mariah shook, but Woodard argued that that's just not the case. "He's a distraction. He is an interloper. Mariah doesn't pay much attention to him. She's not going to be distracted by this small man with his accent from outside of Harlem coming in to domineer the airwaves," she said. "Talk to Luke about Bushmaster. She's not concerned." Season two of Luke Cage is now available to stream on Netflix.